Raptor - Imaging Ultrasonic Flaw Detector Full Featured Ultrasonic Flaw Detector AND Full Imaging System for the price of a STANDARD Flaw Detector! • All-in-one high resolution, high speed, ultrasonic flaw detector, thickness gauge and B-Scan, C-Scan Imaging system • Supports range of manual and automatic scanners for encoded B-Scan and C-Scan Imaging • Spike and square wave tuneable pulser, 5,000Hz PRF • Fully Capable of using Multiple probe types • Colour display (5.7” VGA sun readable) • Portable Instrument in a Robust Aluminium case with rubber end caps • Free Software Updates The Raptor is an All New category in Ultrasonic Flaw Detectors. The Raptor is not only a contemporary high speed flaw detector BUT, also INCLUDES a Full Featured C-Scan Imaging System within the same package. Incorporating three 32 bit microprocessors, the Raptor offers substantially more in capability than ANY conventional flaw detector from ANY competitor. Press the Flaw Mode key and the Raptor performs as any High Performance flaw detector would. Press the Imaging key and the Raptor becomes a full featured Flaw Detector AND Imaging System matching and in some cases exceeding the features of imaging systems costing more than $40,000, at standard Flaw Detector prices !! Why buy any "standard" flaw detector when you can rely on a company offering 35 years of ultrasonic innovation. Three-in-One Instrument The Raptor is an all-in-one high resolution ultrasonic thickness gauge, ultrasonic flaw detector and imaging flaw detector capable of driving a range of manual and automatic scanners. As a high-speed ultrasonic flaw detector, the Raptor is unique with it’s robust aluminium construction, class leading 5kHz PRF, spike or tuneable square wave pulser at 50V-450V and a large 5.7” sun readable screen all as standard. Capable of operating in a frequency range from 0.5MHz to 30MHz it can run single, dual, contact, angle, delay line and immersion transducers. 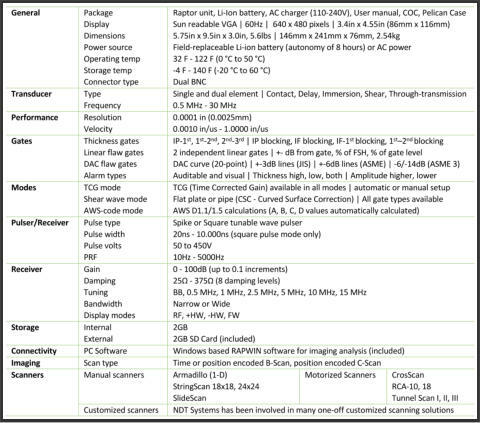 Data storage is through an SD Card for easy transfer and a field-replaceable Li-ion battery gives 8 - 10 hours longevity. The display can run in SplitView screen mode with auto tracking of the echo and a simultaneous view of the B-Scan or C-Scan and the live A-trace. The Raptor simply out-classes any ultrasonic flaw detector available today! 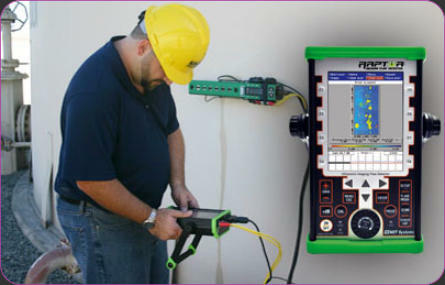 Applications Include: • Ultrasonic Flaw Detection and Ultrasonic Thickness Gauging in most materials • C-scan Ultrasonic flaw detection or ultrasonic thickness gauging • Composite material inspection using thickness or amplitude flaw gates • Investment Castings Turbine blades • Corrosion mapping on pipes, tanks and vessels • Aerospace Inspections • Storage Tanks • Boilers • Metals, plastics, composites, glass, rubber Advanced NDT Ltd & NDT Systems, Inc., are once again pleased to introduce a new and novel concept in Ultrasonic Flaw Detectors. The Raptor ushers in a new category of Ultrasonic Flaw Detectors by offering full imaging capability in a standard hand held flaw detector. 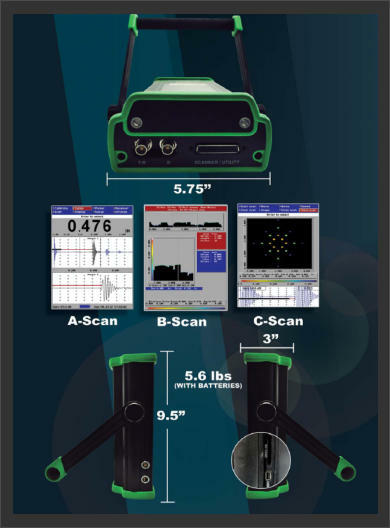 Not only is the RAPTOR a high performance flaw detector offering features usually found on premium flaw detectors but it adds functionality including C-Scan, Dual Axis B-Scan, 3D, Pan & Zoom, Spreadsheet review mode and more. 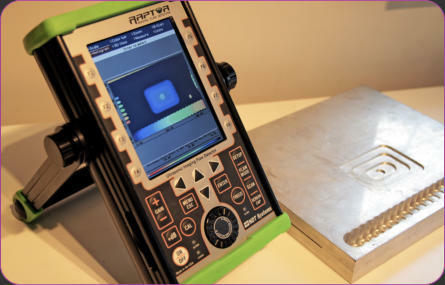 Notable features of the RAPTOR Imaging Ultrasonic Flaw Detector: • Fully sunlight readable 640x480 Pixel 5.7” VGA display. This display is the absolute leading edge technology in commercial flat panel displays. 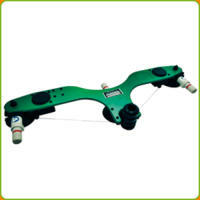 The viewing angle is 160 degrees in all axis making easy to view from any angle. The intensity is also adjustable from 10%-100% • Simple Direct Access Keys to major menu items. • F1-F8 Context Sensitive Direct Access Keys • Sync: IP or IF - 1st, 1st-2nd, 2nd-3rd • (- to -), (- to +), (+ to -) and (+ to +) Gating , either IP-1st, 1st to 2nd or IF • Spike and Square Wave Pulsers are fully user adjustable. 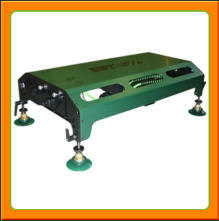 Spike voltage up to 350V and Square wave voltage to 400v, from 10 to 10,000ns in 5ns increments. • Rep Rate is automated or can be user adjustable from 1Hz (ONE Hertz) to 5KHz in The RAPTOR also supports a growing list of available scanners from simple manual scanners to full production oriented scanners incorporating Stepper and Servo drives (via an optional external control unit). There are even lightweight battery powered scanners available providing controlled motion semi automated scanning capability. NO AC Power is required. The battery powered scanners are powered via an external battery pack incorporating the same battery as used in the RAPTOR instrument. More information on the scanners further down the page. Features • Standard package includes instrument, Pelican style shipping case, manual, batteries and AC • SplitScan view- Display A-Trace and B-scan or C-scan simultaneously C-scan imaging • Imaging view: Encoded B-scan, spreadsheet view, pan & zoom, 3D, histogram • 20 point DAC included • Dual A-Trace SplitView • Time and Encoded B-scan, (scanner optional) • Multiple Gate capability • Peak Echo hold: fixed or unique timed 'waterfall' reset • Calibration- Range, Delay, Zero and Velocity • Fully Capable of using Multiple probe types and makes • Auto probe recognition or library selectable • Adjustable Gain • Display intensity 10% - 100% • Audible and visual alarm modes, thickness high, low or high/low. Amplitude +/- level • Programmable user set-ups • Auto 80% gain control • Screen freeze mode, freeze and save • Selectable resolution • Windows based RAPWIN software for imaging analysis • F1-F8 Context sensitive direct access keys • Direct access keys to major menus Advanced Imaging Capability The power of an image cannot be understated and can significantly speed up an inspection and help with interpretation. The images and data produced and captured can prove invaluable for reports and recording inspections. The images can be compared time after to time to see the variations or non variations if any from previous inspections etc. 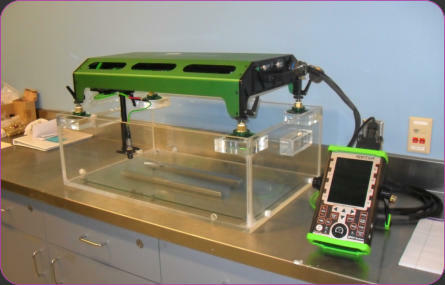 (ideal for corrosion surveys).The Raptor is compatible with a range of manual and automatic scanners. The standard software can define the scan area, index resolution and speed and displays the resulting images live as they are generated. A full suite of software functions is included for further analysis of the results, including B-Scan sections, 3D images, statistical tools for defect sizing and much more. The scanner can also be positioned back to any point of interest. The combined imaging system boasts an unmatched performance for a very low price and is a perfect way to enter the world of imaging and speed up inspection processes in hard to reach areas. 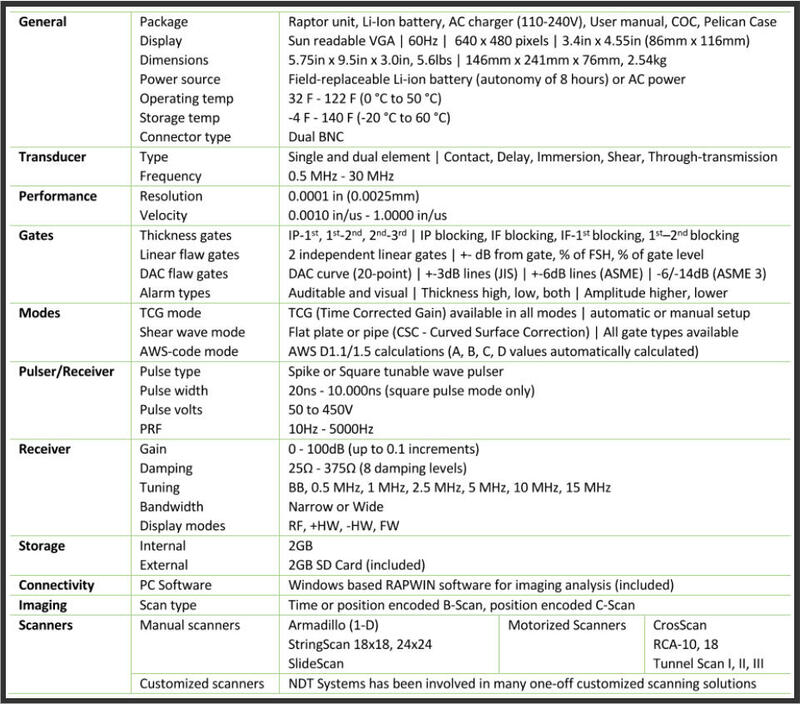 The RAPTOR also supports a growing list of available scanners from simple manual scanners to full production oriented scanners incorporating Stepper and Servo drives (via an optional external control unit). There are even lightweight battery powered (NO AC Power is required) scanners available providing controlled motion semi automated scanning capability. The battery powered scanners are powered via an external battery pack incorporating the same battery as used in the RAPTOR instrument. Raptor - Imaging Ultrasonic Flaw Detector Full Featured Ultrasonic Flaw Detector AND Full Imaging System for the price of a STANDARD Flaw Detector! • All-in-one high resolution, high speed, ultrasonic flaw detector, thickness gauge and B-Scan, C-Scan Imaging system • Supports range of manual and automatic scanners for encoded B- Scan and C-Scan Imaging • Spike and square wave tuneable pulser, 5,000Hz PRF • Fully Capable of using Multiple probe types • Colour display (5.7” VGA sun readable) • Portable Instrument in a Robust Aluminium case with rubber end caps • Free Software Updates The Raptor is an All New category in Ultrasonic Flaw Detectors. The Raptor is not only a contemporary high speed flaw detector BUT, also INCLUDES a Full Featured C-Scan Imaging System within the same package. Incorporating three 32 bit microprocessors, the Raptor offers substantially more in capability than ANY conventional flaw detector from ANY competitor. Press the Flaw Mode key and the Raptor performs as any High Performance flaw detector would. Press the Imaging key and the Raptor becomes a full featured Flaw Detector AND Imaging System matching and in some cases exceeding the features of imaging systems costing more than $40,000, at standard Flaw Detector prices !! 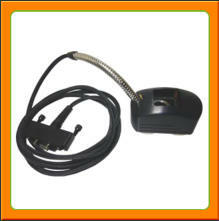 Why buy any "standard" flaw detector when you can rely on a company offering 35 years of ultrasonic innovation. Three-in-One Instrument The Raptor is an all-in-one high resolution ultrasonic thickness gauge, ultrasonic flaw detector and imaging flaw detector capable of driving a range of manual and automatic scanners. As a high-speed ultrasonic flaw detector, the Raptor is unique with it’s robust aluminium construction, class leading 5kHz PRF, spike or tuneable square wave pulser at 50V-450V and a large 5.7” sun readable screen all as standard. Capable of operating in a frequency range from 0.5MHz to 30MHz it can run single, dual, contact, angle, delay line and immersion transducers. Data storage is through an SD Card for easy transfer and a field- replaceable Li-ion battery gives 8 - 10 hours longevity. The display can run in SplitView screen mode with auto tracking of the echo and a simultaneous view of the B-Scan or C-Scan and the live A-trace. The Raptor simply out-classes any ultrasonic flaw detector available today! Applications Include: • Ultrasonic Flaw Detection and Ultrasonic Thickness Gauging in most materials • C-scan Ultrasonic flaw detection or ultrasonic thickness gauging • Composite material inspection using thickness or amplitude flaw gates • Investment Castings Turbine blades • Corrosion mapping on pipes, tanks and vessels • Aerospace Inspections • Storage Tanks • Boilers • Metals, plastics, composites, glass, rubber Advanced NDT Ltd & NDT Systems, Inc., are once again pleased to introduce a new and novel concept in Ultrasonic Flaw Detectors. The Raptor ushers in a new category of Ultrasonic Flaw Detectors by offering full imaging capability in a standard hand held flaw detector. 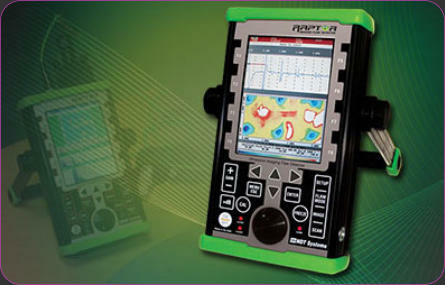 Not only is the RAPTOR a high performance flaw detector offering features usually found on premium flaw detectors but it adds functionality including C-Scan, Dual Axis B-Scan, 3D, Pan & Zoom, Spreadsheet review mode and more. 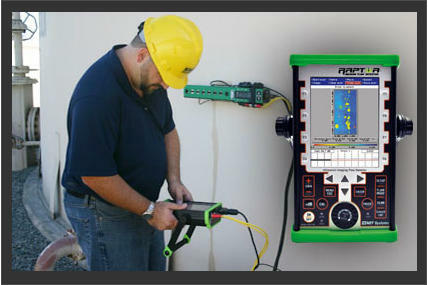 Notable features of the RAPTOR Imaging Ultrasonic Flaw Detector: • Fully sunlight readable 640x480 Pixel 5.7” VGA display. This display is the absolute leading edge technology in commercial flat panel displays. 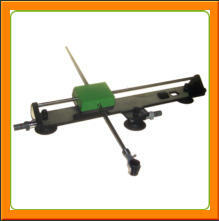 The viewing angle is 160 degrees in all axis making easy to view from any angle. The intensity is also adjustable from 10%-100% • Simple Direct Access Keys to major menu items. • F1-F8 Context Sensitive Direct Access Keys • Sync: IP or IF - 1st, 1st-2nd, 2nd-3rd • (- to -), (- to +), (+ to -) and (+ to +) Gating , either IP-1st, 1st to 2nd or IF • Spike and Square Wave Pulsers are fully user adjustable. 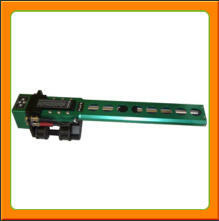 Spike voltage up to 350V and Square wave voltage to 400v, from 10 to 10,000ns in 5ns increments. • Rep Rate is automated or can be user adjustable from 1Hz (ONE Hertz) to 5KHz in The RAPTOR also supports a growing list of available scanners from simple manual scanners to full production oriented scanners incorporating Stepper and Servo drives (via an optional external control unit). 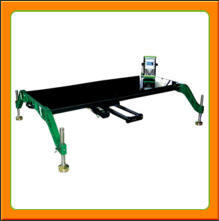 There are even lightweight battery powered scanners available providing controlled motion semi automated scanning capability. NO AC Power is required. The battery powered scanners are powered via an external battery pack incorporating the same battery as used in the RAPTOR instrument. More information on the scanners further down the page. Features • Standard package includes instrument, Pelican style shipping case, manual, batteries and AC • SplitScan view- Display A-Trace and B-scan or C-scan simultaneously C- scan imaging • Imaging view: Encoded B-scan, spreadsheet view, pan & zoom, 3D, histogram • 20 point DAC included • Dual A-Trace SplitView • Time and Encoded B-scan, (scanner optional) • Multiple Gate capability • Peak Echo hold: fixed or unique timed 'waterfall' reset • Calibration- Range, Delay, Zero and Velocity • Fully Capable of using Multiple probe types and makes • Auto probe recognition or library selectable • Adjustable Gain • Display intensity 10% - 100% • Audible and visual alarm modes, thickness high, low or high/low. 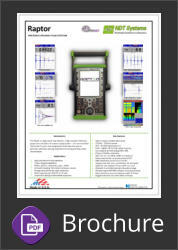 Amplitude +/- level • Programmable user set-ups • Auto 80% gain control • Screen freeze mode, freeze and save • Selectable resolution • Windows based RAPWIN software for imaging analysis • F1-F8 Context sensitive direct access keys • Direct access keys to major menus Advanced Imaging Capability The power of an image cannot be understated and can significantly speed up an inspection and help with interpretation. The images and data produced and captured can prove invaluable for reports and recording inspections. The images can be compared time after to time to see the variations or non variations if any from previous inspections etc. (ideal for corrosion surveys).The Raptor is compatible with a range of manual and automatic scanners. 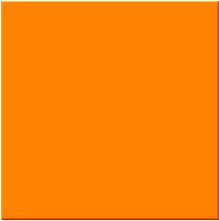 The standard software can define the scan area, index resolution and speed and displays the resulting images live as they are generated. 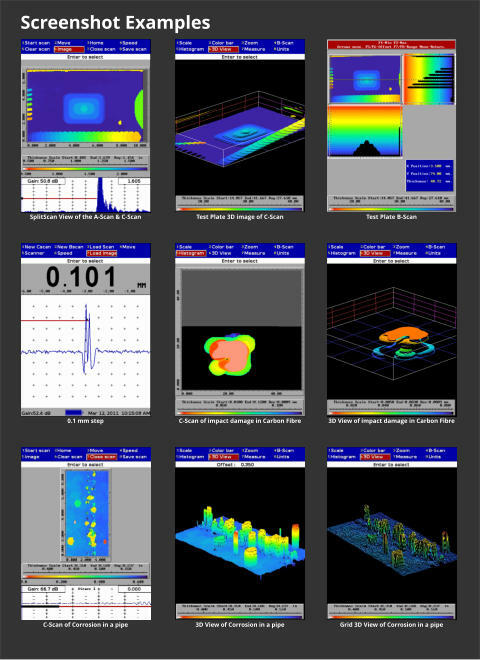 A full suite of software functions is included for further analysis of the results, including B-Scan sections, 3D images, statistical tools for defect sizing and much more. The scanner can also be positioned back to any point of interest. The combined imaging system boasts an unmatched performance for a very low price and is a perfect way to enter the world of imaging and speed up inspection processes in hard to reach areas.